It may be August and the dogs days of summer but Hoboken is never short of politics and in the case of today's Mayor Ravi Bhalla fake news release, hyper-politics. Addressed in his official Fake News release (Bhalla recently applied the term himself) he castigated the Hoboken City Council for modifying a change aiding Hoboken homeowners in their backyard as a "matter of right." Bhalla had vetoed the ordinance overwhelmingly approved 7-2 by the City Council. The change to the ordinance B-40 impacts Hoboken residents limited after Hurricane Sandy where elevation became an impediment to making renovations. The other Hoboken owners most impacted in their backyard, the "donut hole" areas are those who wish to add narrow stairs or a fire escape to their floor above the flood elevation line. Ravi Bhalla, however, is trying to snooker the public as he anoints himself savior from developers. There's that pattern of self-worship appearing again. Why are Hoboken homeowners being insulted and condescended to like this? As Mayor, maintaining the charm and character of our City while protecting our community from overdevelopment is a major priority. You can rest assured that I have your best interests at heart, and not the special interests of developers and their profits. 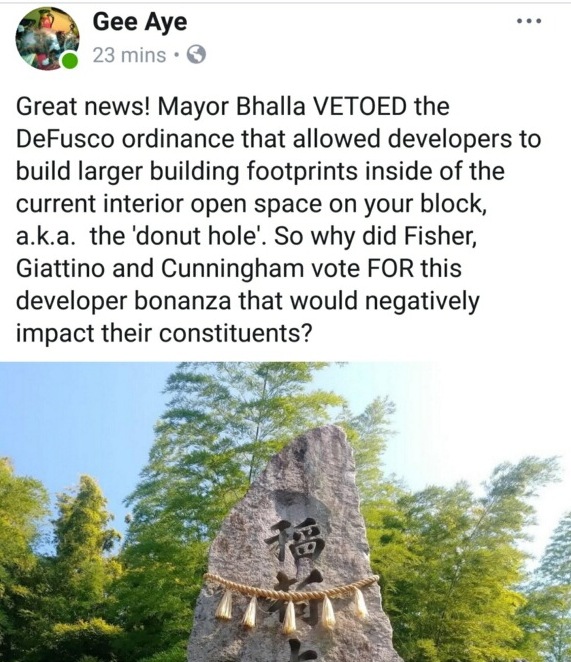 That's why I recently vetoed a developer-favored ordinance championed by Councilman DeFusco that would have reduced the amount light and air in the open area in the middle of our residential city blocks, also known as the "donut hole", all across the City. This ordinance would have resulted in the gradual erosion of rear yard open space and allowed developers to reap the financial benefit of larger units, at the expense of Hoboken's charm and character. The Bhalla Fake News release goes on to lambaste Councilman Mike DeFusco who sponsored the ordinance and is accused of aiding a developer and taking funds from them for this ordinance. All of this is worse than Fake News, it's flat out insulting and condescending to the Hoboken public. The homeowners are local business owners and the ordinance has nothing to do with their commercial business location. DeFusco did nothing wrong here. Previously, the misinformation was put forward on the Ravi Bhalla propaganda site Sybil's Cave via her Theftbook page. Here's another batshit crazy attack on the good governance trio of Peter Cunningham, Jen Giattino and Tiffanie Fisher. Note the false information making this ordinance out to be about developers. The endless down and dirty campaign sliming never ends with these people. Sad! Talking Ed Note: This is a pathetic political attack over a modification most Hoboken residents would welcome. Too often, homeowners in the Mile Square City face onerous zoning burdens to make the most reasonable changes to their homes as in this proposed ordinance. They are forced to spend tens of thousands of dollars and make intensive applications and costly appeals to the Hoboken Zoning Board. Often the process ends in tears, anger and sometimes with departure from the Mile Square City.